Double Suites are $99 per night this weekend so bring the family! Call us at 570-635-5880 or email flyfish@thedelawareriverclub.com to book your room. The wind was tough yesterday but the bugs hatched and the fish ate anyway. 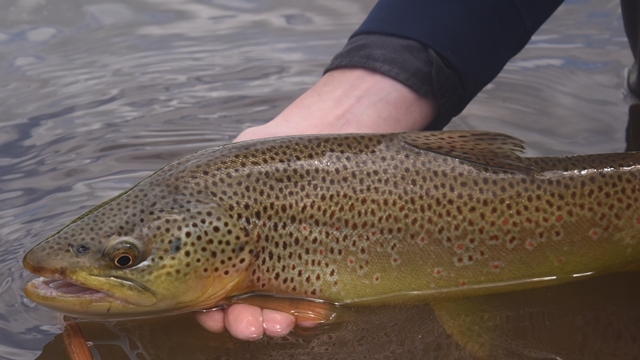 It was another odd day when the best hatching on the West Branch was mid morning through mid afternoon. The sulphurs were coming off and the fish were eating them in the riffles. They were being blown off the water on the flats. There was enough down time that you could make a cast and cover the fish. In the later afternoon into early evening we had more Cahills, Green Drakes, Gray Fox, and a few March Browns coming off. They were still eating a lot of the emergers underneath but we stuck with dries and found enough fish eating on top to keep it interesting. The caddis were active in between the wind gusts too. Today looks like it will be similar to yesterday. Saturday looks great with winds only 5 – 10 mph. The air temp will climb into the high 70’s but it will be so nice not having the wind.